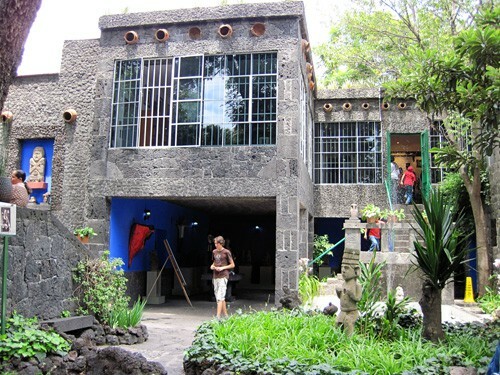 It was a phenomenally special experience to be inside Casa Azul, and I was disappointed over only one thing: they don’t allow photos or video inside the museum and the staff is VERY vigilant about the rules. They allowed photos outside and in the courtyard, which you see here. I wanted to be able to record all the details inside so that I could see them again and again, but instead I just have to close my eyes really tight and remember each of the rooms as I experienced them. Some of the rooms are fuzzy in my memory, but the important ones are mostly there. And I must’ve spent close to 10 minutes standing in front of Viva La Vida, the still life painting of the watermelons (seen in my last post), which is one of my favorites. I felt particularly overcome with emotion in the kitchen, Frida’s bedroom and the adjacent artist’s studio that doubled as a library on the second floor. I was utterly fascinated by the books in the studio – there were books from many different countries, in all different languages. I imagined Frida and Diego poring over the books in the library or one of the various nooks I noticed throughout the house that would’ve been perfect for curling up with a good book and a cup of coffee in just the same way that I like to do at home. The kitchen was a bit smaller than I had expected, but had a very high ceiling. I felt a tinge of jealousy over the humongous olla de barro that sat on the stove. I could only dream of having an olla so big in my little city apartment. It was strange to imagine Frida standing tall enough over some of the pots to stir them, actually. The room was roped off, so visitors could only walk about two feet into the room to admire it. But it was so stunning. The blue, yellow and white azulejos brought tears to my eyes though they were relatively plain, and little decorative pots danced across the wall, spelling out Frida and Diego on each side of the wall over the stove area and two doves on the adjacent wall. I could see why she spent so much time in the kitchen here. And then in another room, there were these beautiful electric blue handmade glasses on a shelf just barely within my reach that looked exactly like a set of glasses that José’s abuelita Elda once owned. A few of those glasses from her collection now sit protected in a glass curio cabinet above a bureau containing silverware and table linens in my suegra’s dining room. The day before I left, as always, I took my trip down the street to the local Gandhi bookstore with my suegro. After I was finished perusing the gastronomía section, we found a book called “Frida Kahlo: Sus Fotos” as we walked through an aisle toward the register and it was open to a page that I recognized. The book contains Frida’s private collection of photographs, which is currently on display at the museum until December 2010; all in their original print form, some were so small they had to be viewed with a magnifying glass tethered to the wall. On the open page was a photo of the bedroom just off the artist’s studio on the second floor. In the exact spot where I had stood on the side of the bed the week before, Frida had sat and been photographed with her pet spider monkey, Fulang Chang. I felt chills up my spine. Now I know I have to go back and visit Casa Azul again. I’m convinced the swells of emotion in particular rooms were not just my excitement, but rather a sort of woman’s intuition picking up on her presence there. I left feeling energized and couldn’t stop thinking about it. Of course, when I had started picking random books off shelves in the gastronomy section earlier, one with a bright pink and orange spine caught my attention. And so the next Spanish-language book on my reading list was also purchased on my trip – “Hierba Santa” by Alexandra Scheiman. It’s the author’s first novel, and it’s all about Frida and a little book she kept to record the recipes of all the things she’d make as offerings for el Día de Los Muertos. I just couldn’t resist once I read the preface and the book also includes recipes at the end of each chapter. Entre los objetos personales de Frida Kahlo había una pequeña libreta negra a la que llamaba “El libro de Hierba Santa”. Era una colleción de recetas de cocina para elaborar las ofrendas con motiva del Día del Muertos, ya que de acuerdo a la tradición, el 2 de noviembre los difuntos obtienen permiso divino para visitar la tierra, y debe recebírseles con un altar formado por flores de cepasúchil, panes azucarados, fotografías cargadas de añoranzas, estampas religiosas, incienso de olores místicos, juguetonas calaveras de azúcar, veladoras para iluminar el camino a la otra vida, y con los platillos predilectos de los difuntos. 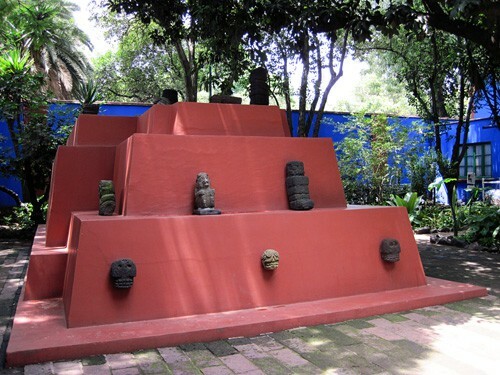 Al ser descubierta entre los objetos del museo ubicado en la calle Londres en el hermoso barrio de Coyoacán, se convirtió en un valioso hallazgo que exhibiría por primera vez en la monumental exposición en homenaje a Frida en el Palacio de Bellas Artes, con motivo del aniversario de su natalicio. Su existencia confirmaba la pasión y el tiempo que dedicaba a levanter sus famosos altares de muertos. El día que se abrió la exhibición al público, la libreta desapareció. I visited Mexico City and Aguascalientes from July 20-28, 2010. If you liked this post, stay tuned for more travel stories and photos from the trip! 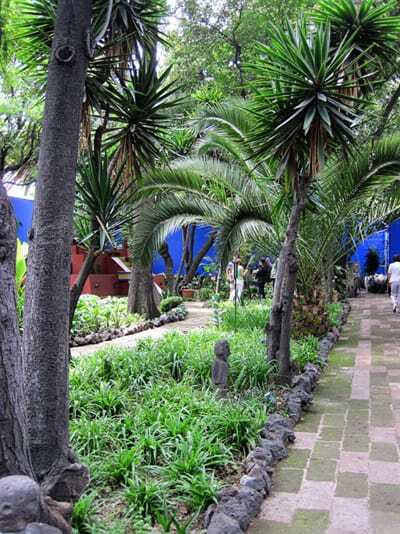 If you can’t make it to Casa Azul, you’ll enjoy the virtual tour that shows parts of the property (including the kitchen) on the Museo Frida Kahlo’s website. Tracy, you’re so funny. I really wish I could’ve taken photos and video inside to share. In the meantime, I highly recommend the link in my last post (& I’ll edit above to add the link again) for the virtual tour on the museum’s website. In the apartment where we used to live, the previous tenant painted one wall in the living room red. We moved to a bigger apartment a little over two years ago and I still miss that red wall. If it wasn’t in my lease that I couldn’t paint in our current place, I would’ve turned it into Little Mexico with pink, cobalt and yellow on the walls by now! When I was living in Mexico City I was lucky enough to live very close to Coyoacan Barrio, actually, it was part of our weekend bike rides. 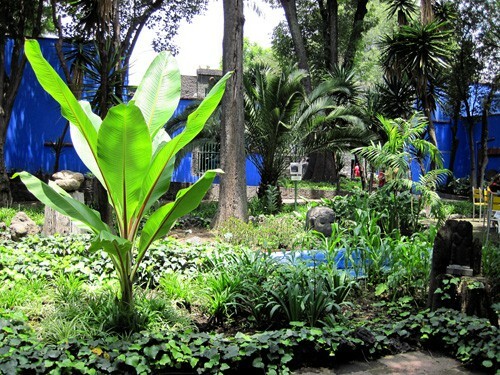 And on these bike rides, Fridas’ casa azul was always a very special spot for me. Frida has always been very close to my heart, I think the fact that when I was a child and I was born with a physical problem that kept me prostrated to bed for almost two years might helped. So yes, I feel very connected to her, and obviously for me, her bedroom was the most emotional part del tour de su casa. Maura, I’m so happy you visited Frida’s house for the first time, I’m sure you will keep coming back (as I hope I will too). Have you been to Diego’s studio as well?. Totally different aura but also a must. ps. 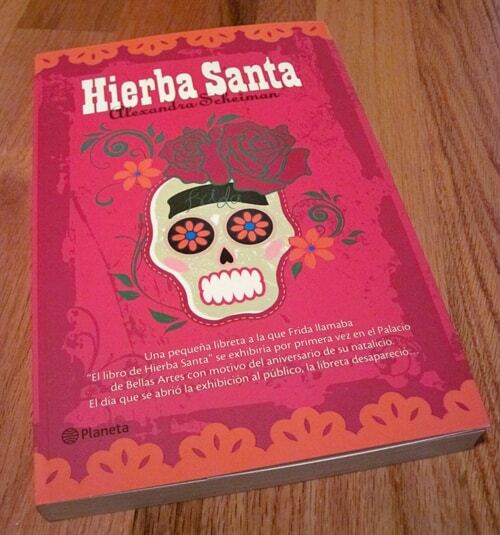 I SO want to read Hierba Santa. Is it good?. How exciting. I’ve never been to Casa Azul, but have always wanted to visit. Unfortunately the one and only time I’ve been to Mexico City I was running around like crazy during a retreat/conference for my church and well, I didn’t have much time to do anything other than visit EL Socalo (which the anthropologist in me loved) and la Catedral de Guadalupe. I really want to go back. Like you I have a list of cities and places I want to visit in Mexico. Someday. I can’t wait to read more about your trip and that book does look interesting. I wonder if I can find it online? @Heidi I haven’t yet had time to visit Diego’s studio, but I hope to on my next trip. I’ve passed by it dozens of times but am always in the area for another reason (i.e. having lunch at San Angel Inn or stopping by the Dupuis to see if they have a matching pillowcase I’ve been looking for or to buy someone a gift). Regarding the book, I’m only one chapter into the book and so far I really like it, although I must admit there have been a handful of times I’ve needed to pull out my Spanish dictionary because I was unfamiliar with a few words. Iove Mexico city. I went to la casa azul and loved it. I see you traveled to Mexico city this past July. I want to go back in September but I am not so sure yet. I have stayed in nice hotel in Polanco and centro historico area. I’ve been reading the travel alerts. Can you tell me in your opinion how did you see Mexico city security wise this time? I have really good friends in Mexico city. Hi Marce, we are frequent travelers to Mexico City as we have a lot of family there. On my most recent visit, I will say that the only thing I noticed was a slightly more stringent luggage-searching going on at the airport (mostly confined to carry-ons for flights boarding to U.S. destinations). Otherwise, I didn’t see anything out of the ordinary from what I usually see. Not even on the 6+ hour drive on the toll roads from Mexico City to Aguascalientes to visit José’s grandma. As with all traveling, inside the country or out, you need to be vigilant and aware of your surroundings. I will continue to travel to Mexico City despite the travel warning (which is mainly to warn against security issues in northern Mexico border states and areas in and around Michoacan), and have a trip planned later this year for the holidays. Common sense should prevail when it comes to transportation choices, such as avoiding inter- or intra-city bus transportation, hailing taxis from unapproved locations and traveling by road outside urban areas after dark. I’d urge you to thoroughly read the entire travel warning for Mexico at the link below and note that Mexico City is not currently listed as one of the areas with security issues due to DTOs. I suspect if you have friends there, you probably speak the language as well – that will give you a little additional feeling of security. I’m happy to answer any other questions you might have about traveling to the D.F. You can always email me from the link in the contact section to your right if you’d like. Wow, the colors in the pictures look beautiful. I hope to visit one day. It looks like this is a MUST visit on any vacation to this part of Mexico. Such a great description of your visit and wonderful pictures! Looks like a must-see. First, we flowed around Xochimilco’s floating gardens in a gondola, and had mariachis serenade us. Then, we hopped back on the tram, got off at the wrong stop, and walked for a little over an hour before we got to Casa Azul. That was about the first six hours of our day, and possibly, a very contrived yet symbolic narrative of Frida’s vida on an extremely small and insignificant scale. I’m not an art appreciator, so when I like an artist, his or her work really, really connects with me. Frida is one. I suppose it’s an extension of what I enjoy most in film and literature – the darker and more depressing, the better. So Frida’s paintings, to me, are what Thomas Hardy and Orson Welles might be to their respective genres. Like you, as I strolled – nay, shuffled – from one room to another, felt like my heart was being stolen to be in one of her paintings – so wrenched, destroyed and annihilated it felt. I learned a lot about Mexico in my 10 days between Ciudad de Mexico and Puerto Vallarta, and nowhere was it more apparent than that afternoon at Casa Azul. Yes, there’s poverty, crime, fighting and depression, but if you find your way out from the chambers and set into the gardens, you’ll see sunshine and usually, a shock of electric blue will jolt you into remember why you are alive – exuberance and passion. Thanks for the happy memories you invoked of my afternoon (and evening) in Coyoacan! I just stumbled across your blog while doing a google search on Mexico City and I love it! This entry in particular makes me very excited about the trip I am planning to the DF in february during a school break. When I mentioned this on an internet forum a bunch of people told me I shouldn’t go and that my time would be better spent in Cuba! I was really disappointed with this response because I’ve been very excited to go, since in university I have studied a lot of anthropology and history on Latin America and am learning Spanish. In any case, for a long time I have wanted to visit Casa Azul as well as the multitudes of other museums and areas of interest in the city (although coming from a city of only 1million people I’m sure it’ll be a shock), and I would like to travel Mexico extensively one day, not just visit resorts like a lot of tourists want to do. I will definitely keep an eye on this blog! I love the way you write Maura. This is one of my favourite places in Mexico. Probably the only place that gave me chills and brought tears to my eyes as I was completely overcome with its energy. Her energy.